Lancaster, Ohio - The Fairfield 33 Alliance will host its third annual Engineering Technology Summer Camp from June 24-28 and July 8-12 for students entering eighth and ninth grades. The camp will be held at Ohio University Lancaster’s Engineering Technology lab and is open to students who will be enrolled at a Fairfield County school or are home-schooled and reside in Fairfield County. There is no cost to attend the camp. In its third year the camp will expand to involve even more students. The first two years saw a combined 45 students graduate the camp. The goal for this year is to provide smaller classes and maintain the focus on junior high students with an attendance goal of 30 students. The 33 Alliance again will partner with Ohio University Lancaster and Lancaster City Schools to show students interested in Science, Technology, Engineering, and Math (STEM) how products evolve from concept to reality. Gina Orr, instructor at Ohio University Lancaster’s Engineering Technology Lab, and Angela Hoy, STEM teacher for Lancaster City Schools will again facilitate the camp. The goal of the camp is to show students the rewarding careers that local manufacturers provide. Manufacturing jobs offer the highest wages on average in the county, with an average wage of $58,000 per year according to the Department of Labor’s Labor Market Information. While most of the time in the class is spent making things, students also get to see local manufacturers like Midwest Fabricating, Company Wrench, and niFco. For more information or to apply for the camp, go to Fairfield33.com or contact Rick Szabrak at Rick.Szabrak@FairfieldCountyOhio.gov or 740-652-7160. A limited number of spots are available and the application deadline is April 19. Participants will be selected based on review of applications and notified by May 3. Sign up for the 2019 Manufacturing Camp click here. Ranging from the cities of Canal Winchester, Lancaster, and Pickerington; the Fairfield 33 Corridor encompasses Violet, Bloom and Greenfield Townships and is located directly between the urban area of Columbus and the scenic beauty of the Hocking Hills. 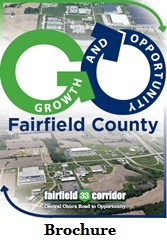 Fairfield County is only a one-day drive for 60% of the United States population and 50% of the Canadian population.